Thank you to all the families who took part in our recently online survey for parents of children who have had or will have a vaccination. 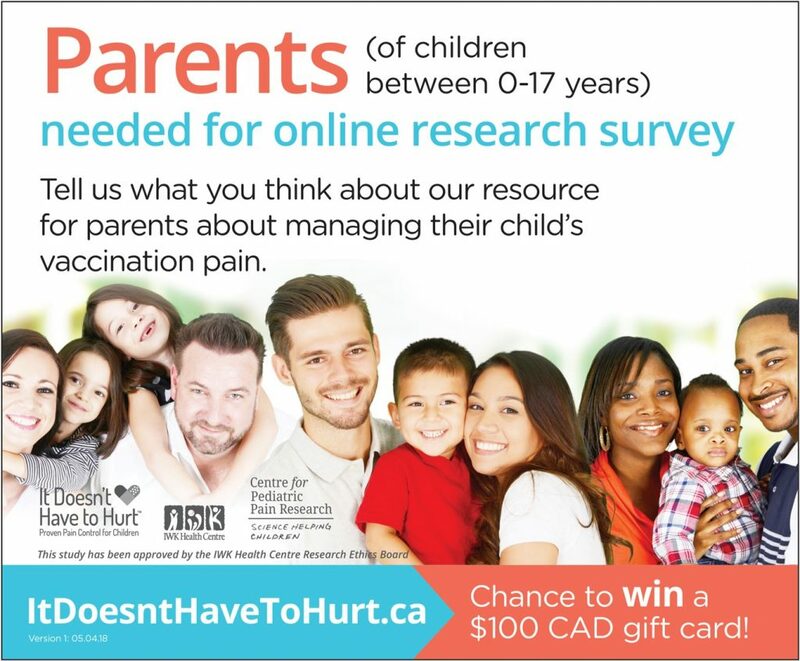 In this study, we wanted to learn about what parents think about an information sheet on vaccination pain management that was created by a team of researchers using the best available evidence-based information about pain management for vaccinations and published by ParentsCanada, a popular Canadian parenting magazine. This information sheet is intended to help parents manage their children’s vaccination pain by providing tips for handling vaccination appointments. The survey is now closed. Please check back here for more information about this project and for a summary of our results when they are ready! Families who entered the draw to win a $100 CAD online gift card as a thank you and will be drawn and contacted shortly. This study has been approved by the IWK Health Centre Research Ethics Board.